It's on the way. Our neighbors within 537 feet of the Corn Valley Pad Site at 210 West Camp Wisdom (between Robinson Road and Carrier Parkway) report that a Pipe is Going Up for the Corn Valley Well 1H Flare. Just yesterday authorities (including the Fire Department, Atmos Energy and the Environmental Services Department) were called when unusual odors were reported coming from the site. This is a very uncomfortable situation for all our neighbors who live so close and must endure this industrial burn-off of shale gas from a gas well.. Interesting that the gas company (Atmos) employee expressed surprise at how close this upcoming FLARE will be to a residential neighborhood. I mean, after all, they are all about gas leaks. This is some kind of LEAK. Update: We called the Texas Commission on Environmental Quality. They are on the way to the site right now. Remember the extraordinarily large fireball FLAME at Robinson Road and Interstate 20 (near Carrier Parkway) that could be seen for miles and miles and for hours and hours...and caused a great deal of concern and anxiety for citizens, well, we're about to see the same thing even CLOSER to Westchester and our residential neighborhoods! 210 West Camp Wisdom Road ~ Corn Valley's 1st Well which sits 537 Feet from Westchester Valley neighbors (who have not signed leases) is scheduled to be FLARED by Chesapeake very shortly...developing story. During Tuesday night's GP City Council Meeting and during the debate about the Lake Parks Pad Site, City Councilman Bill Thorn said he had visited a shale gas drilling site with 14 wells within 200 feet of an elementary school in Fort Worth...and he implied that he saw "No Problem." Watch the video and read the story at the link and then let's talk. Harmful Chemical Found At Drilling Sites Near East Handley Elementary, Dunbar High School and Burton Hill Elementary In Fort Worth ISD. It was a late vote. Thank you, Mayor England, for leading the City Council in support of the DENIAL of the Lake Parks Pad Site. Chesapeake's Grand Prairie Liaison, Laura Patton, spoke for at least 15 minutes and pushed back hard against Environmental Services' recommended DENIAL of this Permit for up to 20 wells at the entryway to Joe Pool Lake. Sometimes, leaders just seem to come to their senses. We are grateful that maybe, just maybe the tide is turning in Grand Prairie. The large landowners who leased the tracts of land to Chesapeake came to City Hall Tuesday night from all over the state. They each one came to the podium to explain how important it was to have their minerals mined out of the Earth at this moment in time. They invoked their family roots in Grand Prairie, God and how they had inherited all this farmland that "deserved" to be drilled for shale gas because they knew it was what their grandmothers and grandfathers would want for their heirs. Well. Not yet, anyway. Mayor England thanked them all for coming to tell their stories and that he remembered their families from days gone by...but this pad site just wasn't going to happen so close to beautiful neighborhoods so near the lake. Thank you, Mayor England, City Staff and the other 4 City Councilmen and Women Councilwoman who voted for DENIAL. It was a good evening at City Hall. "Council Member Mark Hepworth said he heard Mr. Cummings use a word when he equated gas drilling to heavy industry and asked what heavy industry is. He said he had asked the City Planner what constitutes heavy industry in Grand Prairie and was told that the only business that was heavy industry is a salvage yard and the setback for salvage yards is 25-50’ and if toxic chemicals were present there is a 300’ required setback. Gas drilling is a temporary one." Toxic emissions are NOT, I repeat NOT temporary. They are an ongoing ISSUE in the Barnett Shale and anywhere that shale gas drilling and production are being conducted. They are not always visible to the naked eye. Tours of Dish, Texas or Argyle, Texas are excellent starting points. Shale Gas Alley. It's tragic. You won't hear this suggestion from the numerous shale gas operators doing business in Grand Prairie. But you are hearing it from Citizens of Grand Prairie, TX. Thank you. Click Here to see the Permit on the Railroad Commission Web site API# 439-35250. It's so cool that the nearest "Town" shows to be Fort Worth and the County is Tarrant. No mention of Grand Prairie on this Permit's W1 Form. I guess that helps with making it seem "invisible," even though it's a MONSTER. Wake me when it's over. But in the meantime, be sure to show up for the Grand Prairie City Council Meeting Tuesday, February 15th, 2011 at 6:15 PM. 317 College Street, Grand Prairie, TX 75050. Click Here to See the Map to City Hall. Meeting commences at 6:30 PM. This will be an agenda item and a Public Hearing to discuss this Monster Pad Site that is so close to homes and children and the lake...it's mind boggling to think that this City Council is even considering it as a possibility. Oh, And...God. Help. Us. Please. *Critical Update* ~ Thank You, God. Very Much. Amen. According to the Grand Prairie, TX Web site (scroll down to see the Horrible Map on Page 2 that's extremely hard to read)...our neighbors up North will now know what WE know. The invasion of the Thumper Trucks. Stealing information about our property (minerals ~ AKA "property")...without COMPENSATION!! Monster trucks driving through neighborhoods, in tandem, dropping 1,000 pound weights to the pavement, enough to shake your home. 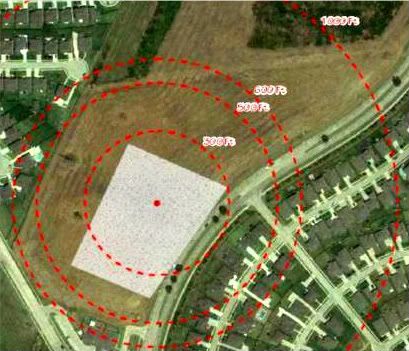 We seriously thought the City of Grand Prairie understood our concerns about seismic testing when it came to South Grand Prairie last summer. It's clear from this ANNOUNCEMENT, they probably don't. So, how much are homeowners/landowners being compensated? Anyone know?? Or is this just back to playing dumb about all of it?? Oh, and that Hotline Number you see ~ just know that it's not a City of Grand Prairie Hotline Number. Update: We see that the energy company listed on the MAP is Newark Energy ~ for the record. It will be on the Agenda as a Public Hearing for the February 15, 2011 City Council Meeting. (It could have been voted on this past Tuesday, but for the weather.) Oh, Lord. This one's a doozy. Thank God Environmental Services is recommending DENIAL. Looking at the maps for this Lake Parks 1H well that will be practically in the backyards of residents...not only that, but the future holds 20 wells for this proposed Padsite. What looks like 1 (one) well, initially...is really the first stage of a MONSTER Padsite on the Road to Lake Joe Pool. The gas well padsite proposed is situated south of Camp Wisdom, west east of 360, to the north of Webb Lynn Road, and directly off of Lakeridge Parkway. The address is 5523 Lakeridge Parkway. The padsite is adjacent to the Lake Parks East and the Lake Parks West subdivisions. 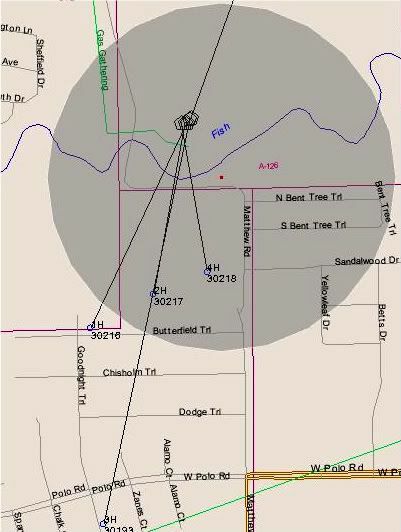 The well bore is approximately 359 feet from the closest protected use (a residence in the Lake Parks East subdivision). There are approximately five other residences within this subdivision that lie within 500 feet of the well bore. 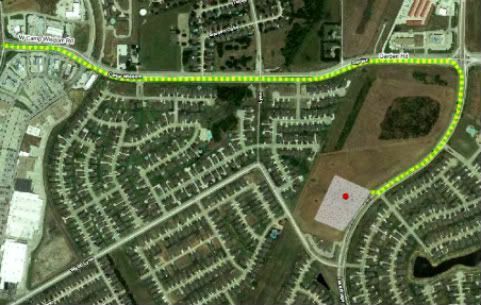 The planned well bore is less than 500 feet from the nearest residences on the westside of the padsite. Additionally, the well bore is approximately 510 feet from the Kidd Academy Day Care facility located at 5555 Lakeridge Pkwy. The permanent padsite storage tanks are planned to be less than 400 feet from the day care center. BEIJING (Reuters) - China's No.3 oil and gas firm, CNOOC Ltd, announced a second shale gas deal with Chesapeake Energy, agreeing to buy a 33.3 percent stake in the U.S. firm's leasehold acres in Colorado and Wyoming for $570 million. Just one more thing to ponder about our shale gas drilling campaign. You know, one of the arguments we hear so much about all of this is how producing our own natural gas will free us from our dependence on foreign oil. Well, I guess this is a new twist on that line of reasoning. The new ones are kinda short. This may explain some of that. The longer one you see is API# 113-30193 (3H) ~ The one under Rule 37 Consideration right now ~Meaning: If you won't sign a lease, Chesapeake will just have the Railroad Commission conduct a Hearing at their (Chesapeake's) pleasure and make you travel to Austin on your own dime dollar and then most likely they'll just take your minerals, anyway, and FORCE you into the Pooled Unit with your neighbors and especially the large land owners. Large land owners who really need you so they can make most of the royalties, if any, for the Lease. Nice, huh? Those pentagon (5-sided) shapes you see are apparently two (maybe three) Pad Sites Leaseholds converging at 4351 Matthew Road with currently 5 different wells permitted and/or drilled from potentially 4 separate leaseholds (that we know of) including...Barnes Assembly A, West Carpo, East Carpo and 2 "Future Wells." There will be up to 11 wells drilled (at this time) from this location according to the Detail Map Below. Notice the Gas Gathering Pipeline (in green) that will get the gas out of there. What was once a beautiful and tranquil cow pasture is clearly now an industrial zone. Oh, and there's Fish Creek, too ~ see it in bright BLUE on the Map. A well-known old creek in southern Grand Prairie that runs right above all the drilling and horizontal, hydraulic fracturing that will be going on in that area in the immediate future. 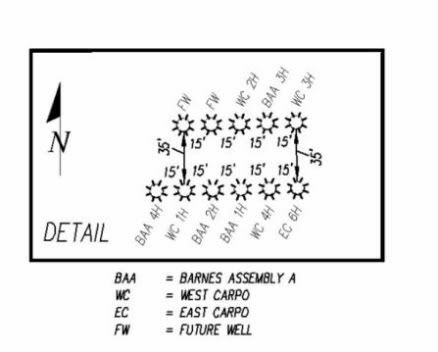 3 More Wells for the Barnes Assembly A Pad Site Leasehold (4351 Matthew Road) were approved Monday for Chesapeake by our almost-defunct Texas Railroad Commission. Very interesting that these horizontal wells seem to be shorter in length than our well-known API #113-30193, which dips very deep into Trailwood. Maybe they're more like shots-in-the-dark...or rather like a lot of Rule 37 "Waiver" Notifications arriving in the mail very soon for our Trailwood neighbors. Stealing property and/or paying very little for it seems to be all the rage. New Barnes Assembly A Permits ~ API #113-30216, #113-30217 and #113-30218. QUESTION: Since all the activity related to the Barnett Shale is in the BARNETT SHALE, why are all the citizens affected by Rule 37 Waivers required to travel to Austin to DEFEND their property rights?? Somebody really needs to answer that question in the TEXAS Legislature. True Intent of HB 40??? - Read this eye opener and then take the quiz at the end. Psst....it is a real easy quiz! 850 Feet from a United States Army Corps of Engineers Flood Control Dam (Joe Pool Lake Dam). Raymond Crawford, Actual Citizen, Fought the City on Fracking -- and Won! Westchester is a beautiful residential community located in the southwestern corner of Dallas County, Texas. It's North Central Texas. In 2007, our Homeowners Association (Westchester Association of Homeowners) declined the offer for a bonus check from landmen representing Chesapeake. But that didn't stop them from going to our homeowners individually seeking mineral leases. Nor did it stop them from setting up a Seismic Testing Camp near Joe Pool Lake Dam in May 2010. Like so many cities in North Texas, we're lost in gasland. This is our journey. We have a Blog. A Facebook Page. And a Twitter Account. Google us. Thank you. © 2010 Westchester Gasette. Theme images by enot-poloskun. Powered by Blogger.